For the English footballer, see Ronnie Dunn (footballer). In 2019, Dunn was inducted into the Country Music Hall of Fame. Dunn was born in Coleman, Texas, and attended 13 schools in his first 12 years of school. He began school in New Mexico and finished his formal education at Abilene Christian University in 1975 as a psychology major. When he began playing bass guitar and singing with bands in clubs in the Abilene, Texas, area, the university gave him the choice of either quitting the band or the university. He chose to leave the university and moved to Tulsa, Oklahoma, for a chance at the country music scene. He lived there for many years while drawing much inspiration from local honky tonks such as Tulsa City Limits, which is prominently featured in the music video for Brooks & Dunn's hit "Boot Scootin' Boogie". While he was in college, he served as a music and youth minister at Avoca Baptist Church in Avoca, Texas. Ronnie began his musical career as a solo artist. He charted two minor singles with Churchill/MCA Records: in 1983 he released "It's Written All Over Your Face", and in 1984, "She Put the Sad in All His Songs". In 1990, he and Kix Brooks formed Brooks & Dunn. In 1991 they released their first album, Brand New Man, certified 6x platinum by the RIAA. Brooks & Dunn released 12 studio albums, two greatest hits albums, and a Christmas album. 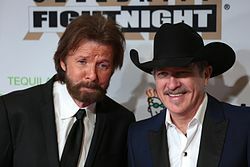 Brooks & Dunn sold over 30 million albums, had 20 number-one singles on Billboard, and were one of the most consistently successful acts on the concert circuit. In 2009, they announced that they would disband in 2010. On December 3, 2014 it was announced that Brooks & Dunn would reunite along with Reba McEntire to perform a series of concerts throughout the summer and fall of 2015. In late 2010, Dunn announced that he was working on a solo album. The album's first single, "Bleed Red", was released to country radio on January 29, 2011, and debuted at number 30 on the Billboard Hot Country Songs chart for the week ending February 19, 2011 and ended as a Top 10, his first of his solo career. Dunn's self-titled album Ronnie Dunn was released on June 7, 2011. The second single from the album, "Cost of Livin'", was released on June 6, 2011, and debuted at number 56 on the country chart. It peaked at number 19, followed by "Let the Cowboy Rock" at number 31. The album debuted at number one on the Billboard Top Country Albums, as well as number 5 on the Billboard 200, selling 45,000 copies in its first week in the US. In June 2012 Ronnie Dunn took to social media to ask his fans what the fourth single on the album should be. Shortly after, Ronnie got a call from the executives at Sony Music saying that his "fb post killed the "Let The Cowboy Rock" single. He then requested for radio to start playing "Once" as the next single. Before the song could be released to radio as a single, he was released from the label. In March 2013, Ronnie Dunn previewed the song "Country This" on Sound Cloud. On June 4, 2013, Ronnie released the two new tracks, "Country This" and "Kiss You There", exclusively on iTunes. The songs were each previewed for a month on The Highway on Sirius XM. On July 9, 2013, Dunn announced his new record deal, a joint effort between HitShop Records and his own label Little Will-E Records with HitShop executing radio promotion while Dunn retains personal brand control. The lead-off single for his second solo album, "Kiss You There", was released to country radio on July 29, 2013. After an unsuccessful run with "Kiss You There", Dunn and HitShop Records parted ways. On November 19, 2013, Dunn released the second single from the forthcoming album, "Wish I Still Smoked Cigarettes". In January 2014 Dunn also released "Grown Damn Man" as a promotional single from the second solo album. The album, Peace, Love and Country Music, was released on April 8, 2014. On December 1, 2014, Ronnie Dunn began to speculate on his Facebook page that he had signed with the newest imprint of Big Machine Label Group, NASH Icon, but the label never confirmed nor denied. On January 12, 2015, President of Big Machine Scott Borchetta officially announced that Dunn had joined Reba McEntire and Martina McBride making him the third artist to join the roster. Borchetta stated in a press release "Ronnie Dunn has one of the smoothest, most-recognized and most-popular voices of the last twenty five years in Country music. I’m truly honored to have him join us and take his rightful place as an Icon. Great music is on the way." Dunn also commented in the article saying "This is the best possible scenario that I can imagine. The Big Machine and Cumulus combination is a force, and I am proud to be included in this innovative venture". The press release went on to announce Ronnie Dunn was about to hit the studio to record what is now his third solo album and that the lead off single of the album was released in early spring of 2015. The lead single from Dunn's third solo album, "Ain't No Trucks in Texas", was released on July 17, 2015. On April 22, 2016, Dunn announced the second single, "Damn Drunk", on his Facebook page. The song was released August 5, 2016. On August 22, 2016, Dunn announced that the title of his upcoming third solo album will be Tattooed Heart and It released on November 11, 2016. Dunn married his wife, Janine, on May 19, 1990; the couple have two daughters and a son. 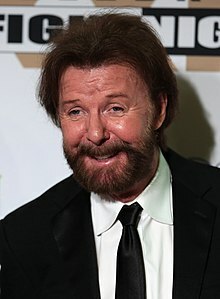 Ronnie Dunn has over 15 Grammy nominations, has won 24 Broadcast Music Incorporated (BMI) Million-Airplay awards and BMI Country Music Songwriter of the Year in 1996 and 2001. He has received more than 27 ACM awards, winning Top Vocal Duo every year since 1991 except for 2000 when the honor went to Montgomery Gentry and 2007 and 2009 when the honor went to Sugarland, including three Entertainer of the Year awards and vocal event of the year in 2005, for their hit "Building Bridges" with Vince Gill and Sheryl Crow's background vocals, along with his Single of the Year for his gospel song "Believe." He is a member of the Texas, Oklahoma and Arkansas Music Halls of Fame. Brooks and Dunn have won more Country Music Association awards and Academy of Country Music awards than any act in the history of country music. Dunn was also the National Anthem singer before Game 3 of the 2011 World Series in Arlington, Texas. "It's Written All Over Your Face"
"I Wish I Still Smoked Cigarettes"
"I Worship the Woman You Walked On"
"That's Why They Make Jack Daniels"
^ Bronson, Fred (1995-06-03). "They Write the Hits". Billboard: 60. ^ "About". Brooks & Dunn. Retrieved 6 March 2019. ^ "Adele Reclaims No. 1 on Billboard 200, Book of Mormon Makes History". Billboard. Prometheus Global Media. Retrieved June 15, 2011. ^ Freeman, Jon. "Ronnie Dunn Releases "Peace, Love and Country Music"". Country Weekly. Retrieved April 8, 2014. ^ Whitaker, Elizabeth. "Ronnie Gene Dunn". The Encyclopedia of Arkansas History and Culture. Retrieved 6 March 2019. ^ Wick, Sherri. "Ronnie Dunn & Wife Janine - Living the Dream (Feb. 26, 2018)". Country Fancast. Retrieved 6 March 2019. ^ "Country Albums - Biggest Jump - June 25, 2011". Billboard. Prometheus Global Media. Retrieved July 2, 2011. ^ "Billboard 200 - Biggest Jump - June 25, 2011". Billboard. Prometheus Global Media. Retrieved July 2, 2011. ^ "Canadian Albums - Biggest Jump - June 25, 2011". Billboard. Prometheus Global Media. Retrieved July 2, 2011. ^ "The Official Charts - Country Albums - June 18, 2011". The Official Charts Company. Retrieved June 15, 2011. ^ Bjorke, Matt (March 13, 2017). "Top 10 Country Albums Sales Chart: March 13, 2017". Roughstock. ^ "Ronnie Dunn Album & Song Chart History - Country Songs". Billboard. Retrieved March 22, 2011. ^ "Ronnie Dunn Album & Song Chart History - Country Airplay". Billboard. Retrieved August 19, 2013. ^ "Ronnie Dunn Album & Song Chart History - Hot 100". Billboard. Retrieved March 22, 2011. ^ "Ronnie Dunn Album & Song Chart History - Canadian Hot 100". Billboard. Retrieved March 22, 2011. "Ashley Monroe Album & Song Chart History - Country Songs". Billboard. Prometheus Global Media. Retrieved March 22, 2011. ^ "I Can't Help Myself - Ronnie Dunn | Music Video | VEVO". VEVO. Retrieved July 25, 2011. ^ "How Far To Waco - Ronnie Dunn | Music Video | VEVO". VEVO. Retrieved July 25, 2011. ^ "CMT : Videos : Ronnie Dunn: Cost Of Livin'". Country Music Television. Retrieved July 25, 2011. ^ "CMT : Videos : Ronnie Dunn: Let the Cowboy Rock". Country Music Television. Retrieved January 17, 2012. ^ "CMT : Videos : Ronnie Dunn: Kiss You There". Country Music Television. Retrieved November 22, 2013. ^ "Carrie Underwood, Justin Moore + More Nominated for 2011 Inspirational Country Awards". Taste of Country. Retrieved September 3, 2011. This page was last edited on 10 April 2019, at 23:54 (UTC).